Alan’s Factory Outlet Amish-built wood gazebos are a great place to relax in your backyard. Gazebos are normally roofed, wooden structures placed outdoors, most often in gardens, to provide shade or shelter. 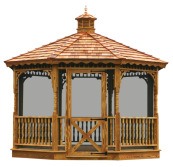 Our wooden gazebos are custom-built in the size and style you want and come in octagon, oval, and rectangle shapes. 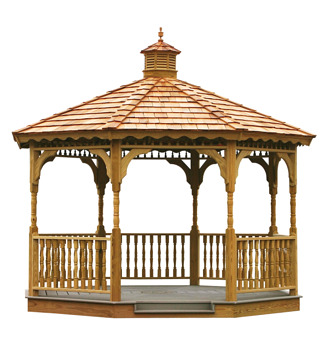 Traditionally, octagonal wood gazebos have been the style for a basic gazebo, but the different layout and size of oval and rectangular wooden gazebos can be a more attractive option in some spaces. While gazebos come in a variety of materials, a wooden gazebo is the best bet. A simple wooden gazebo is easy to clean and maintain and lasts for a long time, and it looks really nice in a yard or garden. If you don’t have enough room for us to deliver the fully assembled gazebo, we have wood gazebo kits that have pre-cut wood pieces. Accompanying instructions explain in detail how to assemble your wooden garden gazebo. No-fuss pieces and clear instructions make putting together a wooden gazebo with our kits a fairly simple process. For the heavier pieces of the backyard wooden gazebo, you’ll want to enlist a friend. Wood gazebos should only take a few hours to assemble. Once your wood gazebo has been set up, you can then furnish and decorate it. Some people prefer to leave their wooden gazebo unfurnished; many others fill their wood gazebos with seating, cushions, a coffee table, and perhaps a floor rug. To complement the gazebo’s wooden structure and detailing, we recommend furniture made from natural materials such as wicker. The openings of the wood gazebo can be left open or protected with screens to keep out annoying bugs. Screens are just one of the many optional features that we offer with our wooden gazebos to help customers create the perfect package for their needs. We have plenty of other features to select from to create your perfect customized wooden gazebo. Pick a single or double roof for your small wooden gazebo. Every wood gazebo for sale comes standard with 30-year architectural shingles. A cupola is standard on all octagonal and oval gazebos. Optional screens, turned wooden post, scalloped face board, and sealer are available for each wooden gazebo. Single roofs offer a simple, elegant look for a gazebo, while a double roof adds an element of style. Since these gazebos are Amish handcrafted pieces, you can be sure that they are made with the utmost care and a high attention to detail. After all, Amish-made construction has garnered its renowned reputation for good reason! Gazebo kits are available in three styles: wooden rectangular gazebo, wooden octagon gazebo, and wooden oval gazebos. In addition to wood, gazebo kits come in vinyl. Wooden cedar shingles are optional with each wooden gazebo for sale. You have the option to pick a color for the architectural shingles on your outdoor wooden gazebo and to upgrade to cedar shake shingles upon request. 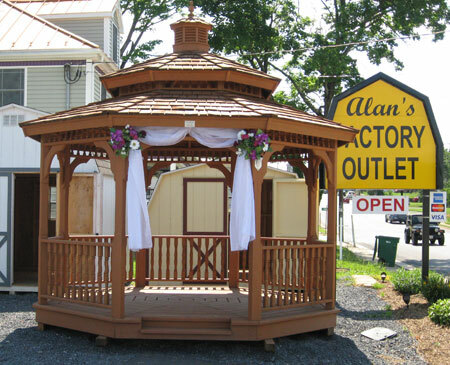 Whether you want a traditional octagonal gazebo or a unique rectangular gazebo, Alan’s Factory Outlet has the kits you want. You can trust us to deliver a quality gazebo for cheap; wood gazebo prices start at about $4,000. 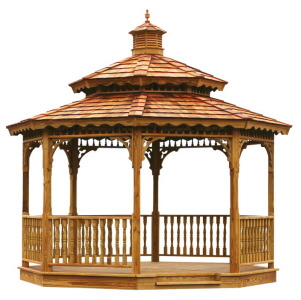 We work hard to offer a competitive price on every octagonal, oval, or rectangular wooden gazebo we sell. And each wood gazebo can be delivered for free in 21 counties in VA and WV. Call us to today at 1-800-488-6903 or contact us online to ask a question or request a quote for octagonal, oval, or rectangular gazebo plans.